Saturday, July 31, 1993, was wet and stormy, like much of the spring and summer before it. And it was hot — brutally hot. It was also the last day Valmeyer would be the quaint community nestled at the base of the bluffs. Early in the morning of Aug. 1, the Mississippi River reached nearly 50 feet — the level engineers feared would spell “disaster” for the agricultural levees south of St. Louis. The Columbia levee was the object of herculean efforts over the past few weeks to strengthen and heighten. The 45-foot-tall levee was built to withstand a 50-year flood, and the fact it was still intact and holding back the water of a 100-year flood was a source of amazement. “That levee system lasted way longer than it should have,” said Norman “Claude” Strauser, formerly with the U.S. Army Corps of Engineers. It had been raised to 50 feet with sandbags, and in the early morning hours of Aug. 1, all 50 feet of the levee were tested as the river hit its highest crest ever. But, finally, it had reached the limit of what it could do. News cameras were rolling high above the levee as water began seeping between the sandbags. Quickly an entire segment of the levee was breached, and footage of the Virgil Gummersheimer farm taking the brunt of the river’s force would be shown around the world. As the house and outbuildings were swept away, Valmeyer’s fate was sealed. “We had issued a voluntary evacuation order the previous Sunday, encouraging people to pack up their belongings and move them to higher ground, so when it got to the following Friday and we did the mandatory evacuation, most people felt we knew what we were talking about,” said then-Valmeyer Mayor Dennis Knobloch. Residents like Susan Schillinger had evacuated some time ago, but still came into the town daily to check on their properties and possessions. “I wanted to bring my dogs home for the afternoon, I wanted to barbecue, I wanted to cut the grass,” Schillinger says of her visit to her house on the east side of town on July 31. She scrambled to find a telephone in her packed belongings and frantically called friends, family and co-workers, who rallied to help her move whatever they could from her upstairs, but it was a difficult task. “I called moving companies, trucking companies, everything. They’d say, ‘We’ll call you back in a few minutes.’ Nobody ever called back,” she said. Finally, a truck rental company in Red Bud did call back, and sent a flatbed truck and two men to help. “They said, ‘You need to figure out where you’re going with your stuff,’” she said. But all area storage units were full. Friends and family stepped in again and offered their basements and spare rooms for Schillinger to store her things. “At one point my bed was in six different cities,” she said. Items that weren’t breakable were tossed out the window to hasten the process. By the time the men with the truck had to leave, almost everything had been saved. “I tried to pay them and they wouldn’t take it. Not even gas money. They just said they had another emergency they had to get to,” Schillinger said. The National Guard made their way through the town and told everyone it was time to leave, and Schillinger went to her mother’s home, where she watched the river overtop the Columbia levee. “That house in Columbia (Gummersheimer’s), it looked so much like mine. It just about killed us,” Schillinger said. For Knobloch, who was intimately involved in every step of the emergency response, Aug. 1 was the most difficult for him. “The night that the levee broke, around midnight on the night on Aug. 1, we had come back in from the levee and there was a group of emergency folks on the east side of town, standing by the cemetery, and this guy from Illinois Power came up to me and I explained to him what had happened and that the water was heading our way,” Knobloch said. “At that point I gave him permission to turn out the lights. “And I can still recall standing there on that hill and watching as the town went dark,” he said. Corps engineer Strauser also had to make a difficult decision on Aug. 1. “My boss said to me, ‘We are not going to let Prairie du Rocher go under water. I’ve got a helicopter waiting for you and you’ve got an hour to figure out some sort of plan to save Prairie du Rocher. You’re going to fly down there and tell those people what you’re going to do,’” Strauser said. His idea was one that had never been tried before, and it made him more than a little nervous. He wanted to notch the Harrisonville levee, just south of Valmeyer, and redirect the water back into the Mississippi River. “I didn’t know it was going to work but I did know if we didn’t do anything we were going to lose Prairie du Rocher,” he said. They started letting the Mississippi River in at that notch, which created a pool of water that acted as a buffer to slow it down. But there was still more water than the Prairie du Rocher levee could hold back. “We sent hundreds of people building a sandbag wall on the lower end of the Harrisonville flank levee to contain that pool of water because it was going to come up to the same level as the Mississippi,” Strauser said. It worked, and the water made a 90-degrees turn back into the Mississippi River. 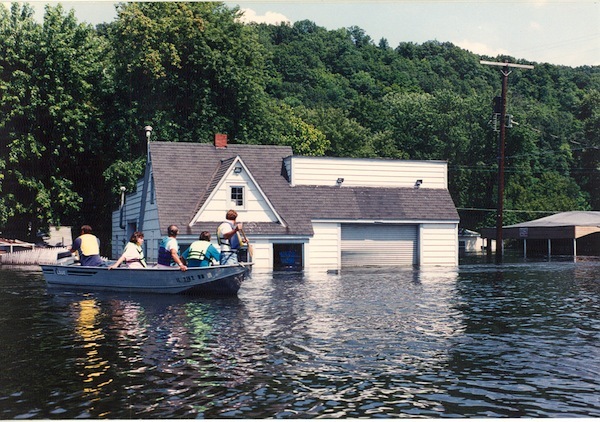 Within days of the flood water arriving in Valmeyer, the first meeting was held for residents, and the possibility of relocating the entire town was introduced. “Just as fate would have it, George Andres, who was the regional planner with SWIMPAC, had grown up in Valmeyer, his dad was a former mayor in Valmeyer, and his mom still lived there. He had stayed in close communication with the village at the time of the flood and he was in communication with the village board immediately after the flood. He was the first one that brought the idea of relocation to the table,” Knobloch said. By mid-August, residents could go back to their property if they could safely access it. Water had reached up to within inches of her first floor ceiling. Schillinger, who, like many in the flood plain, did not carry flood insurance, believed FEMA would not buy out property owners without the insurance. She took out a $40,000 loan and got to work bringing her house back. The road ahead would be bumpy and long for residents like Schillinger, who, for a variety of reasons, chose to try to eke out an existence in the flood-ravaged community, as well as for those who explored the other option, the “crazy” option — relocating the town and starting over.